all the years, the scars and struggles, the happiness and the prosperity. These rings build strength and endure it to continue. Honoring 41 associates whose careers have spanned up to 40-years, the 2017 recognition banquet capped a week of activities celebrating Cambridge employees and their many milestones, memories and legacies. The event was attended by more than 300 employees and guests and also marked the company's most successful year in its 106-year history. The seven honorees who reached their 40-year milestone include six Dorchester county residents and one former resident now working in the company’s Brownsville, Texas plant. All seven began their careers in 1976 working as welders and fabricators. They are: Billy Cannon (Cambridge); David Eskridge (Hurlock); Kent Elzey (Cambridge); Pops Cannon (Cambridge); Ricky Mooney (Cambridge); Wayne Travers (Brownsville, TX); and Mark Tyler (East New Market). Left to right: Mark Tyler, David Eskridge, Ricky Mooney, Kent Elzey, Billy Cannon and Ricky “Pops” Cannon. Missing (but equally appreciated!) is Wayne Travers. Tracy, Barry McInturff, Charles Gabbin and Tom. Tracy, Alan Wright, Tessie Hernandez and Tom Ross. Tracy, Augie Keene, Bob Maine, Bruce Gootee, Antonio Sanchez and Tom. Not pictured: Adrian Cisneros, Charlie Coffman, Eric Lewis, Paul Era, Steve Doran, Teresa Dayman, Willie Lewis, Freddie Ortiz. Cortez Molock (left) and Charlie Hennigar (between Tracy and Tom). Not pictured: David Peskett. Left to right: Tracy, Jimmy Whitby, Pam Toth, Frank Barcus, Tom Ross. Not Pictured: Marcia Patchett, Tom Perdue, Corey Foxwell, Mike Sampson. 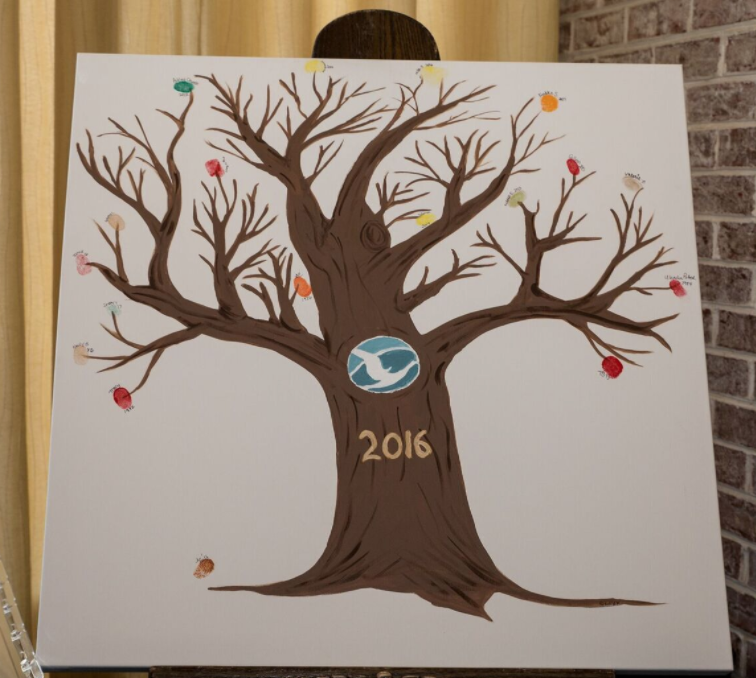 As service awardees checked in, they planted their thumbprint on a tree and received a corsage distinguishing their 2016 anniversary milestone. Shown left to right: Anna Culler, Ulandia Potter and Stephanie Smith. 10 Years: Billy Hubbard (Linkwood); Bob West (Madison); Brian Satterfield (Mardela Springs); Brownie Warfield (Cambridge); Cathy Warfield (Cambridge); Freddie Smith (Cambridge); Jerome Travers Jr. (Cambridge); and, Mike Truitt (East New Market). Architectural mesh team members (left to right) Trent Slacum, Skip Coleman and Eric Coady. The evening's celebration was coordinated by a team led by Human Resource Manager Ashley Church (center) shown here with engineer Tom Busch and Stephanie Smith. See a complete album of photos on Facebook.